I’ve always felt the steady rhythm of beads moving through your fingers comforting as they introduce a regularity, a heartbeat which calms my racing mind. From Catholic Rosary beads as a child or in later years rounds of mala beads provided this route yet neither fitted as they weren’t my tradition. 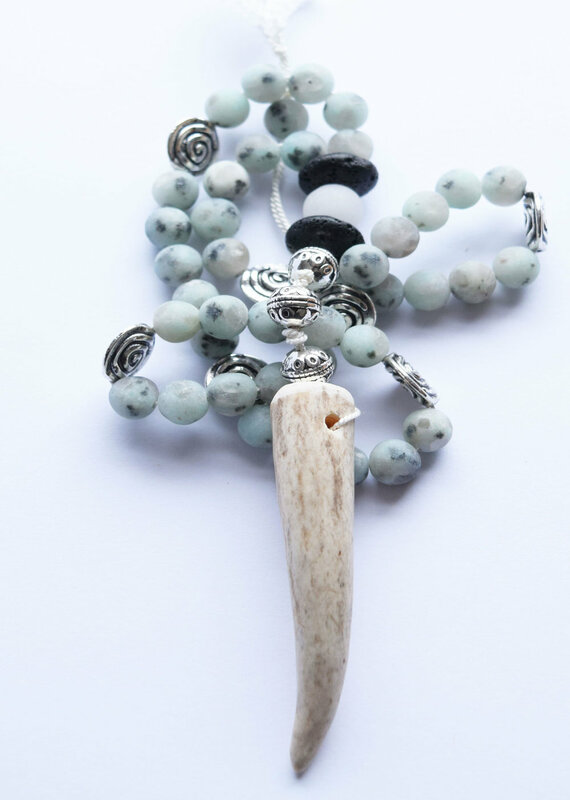 While I am only vaguely familiar with traditional Celtic prayer beads – the Paidirinean, I was drawn to create Celtic Soul Craft Prayer Beads. Celtic Soul beads are born from my tradition which involves a deep communication with the land and a relationship with the ancestral energies of that place. My culture is a circle culture which stretches back through generations of wise women, of women who knew the thresholds of life and death and carried the stream of their ancestor’s voices. Ancestors who were weavers, drummers and singers – women versed in herbalism, stone medicine and doll making, women whose language was ritual and ceremony, women who danced between the worlds. The circle the beads form is based on the Wheel of the Year and the eight festivals. It is the great cycle of birth, death and rebirth which honors the great mystery. Step Beads – Three silver beads. I think of these three beads as steps we take on the way to a place of worship, it might be steps out to a favorite tree, preparing for meditation, or the familiar steps into a shrine or temple. Mystery Bead – The mystery bead is usually the largest bead in the set, it invites us to consider the mystery that exists in all things and is the source of everything. It also invites us to let go of everything we know, of expectations and step into the mystery. Circle of Beads – The beads are divided up into eight sections which represent the eight festivals of the wheel of the year. Each section has 5 beads which adds to a total of 40 beads. The circle of the beads represents the eight festivals of the wheel of the year. My interpretation of the wheel follows the Ancestral Mothers of Scotland which is inspired by my ancient foremothers, folklore and legends. Considering the wheel is an invitation to connect to those stories, and the reflections which arise. You can work with the beads and concentrate on the thresholds, those places which are of both and of neither – and keep a foot in both worlds. Autumn Equinox – Marks the great threshold as we descend into the dark of the year. Samhain – Celtic new year and a time to honor our ancestors and the great crone – the Cailleach. Winter Solstice – The rebirth of the sun at Newgrange marks rebirth. A time to honor the Old Antlered One, the reindeer goddess. Imbolc – Honoring Brighid’s return to the world. Spring Equinox – Marking that point again as we move into the outward time of the year and emerge back into the world. Beltane – A time to honor desire in all forms. Exploring an ancestral longing for a place and time we can't quite pinpoint. A time to explore our 'wild self' and explore how we bring elements of her into our life. Summer Solstice – Summer often finds me on the islands off the West Coast of Scotland and I’m inspired to work with the energies of the Amazon’s of myth and legend of these islands. Lughnasadgh – A Celtic harvest festival and a time of greats gatherings. Exploring the maps of the Wise Women and their environments as well as celebrating the gathers, and not the hunters story. Each person is invited to find their own meaning. My main use of these beads is to pick them up and begin the pilgrimage with my fingers around the circle. As I begin to think about the circle I’m traveling I imagine breathing into that circle, it is a circle which holds all the mystery of life. I breathe out what I’m holding and want to release and then breathe in from the circle – it’s one of the few things that quiets my mind and lets me connect to the vastness of life with its thousands of connections. I find this is a wonderful morning meditation to root you into the day. You could consider using a chant, or simply a few words which offer the essence of the particular holy day or to represent a situation or how you fell or wish to feel. You might have selected your prayer beads being drawn to the pendant or the stones. You don’t even need to know the properties of the stones (I myself am very much a beginner) yet I find it a divination of sorts to see what stones we are naturally drawn to. Sometimes just sitting meditating and holding the stones is enough for them to work their stone medicine! It’s best not to leave your prayer beads hanging on something as a way of displaying them as this can weaken the silk thread. I’d also minimize getting them wet. For energetic cleansing, I’d personally place them on a bed of hematite (which I do for all the set’s I create) and you may be drawn to your own way of doing this such as leaving them out under a full or dark moon. of the larger set of prayer beads. There are 13 beads related to the 13 moons of the year. and allow ourselves to ground and know we have the strength of our ancestors with us in whatever we might be facing. 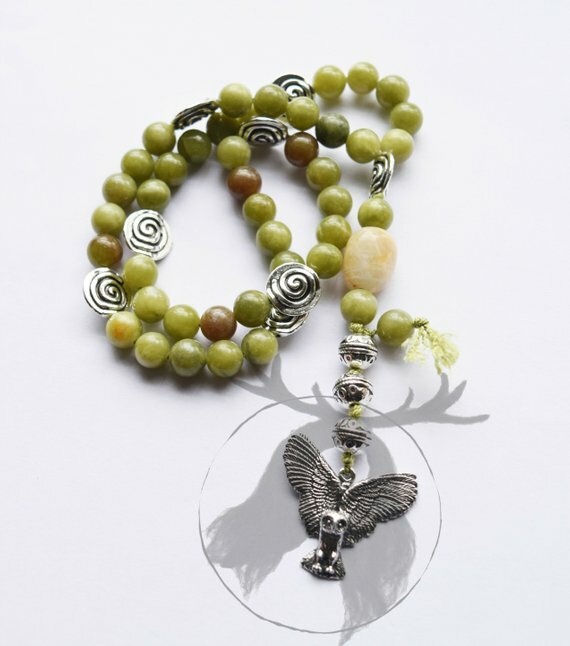 These prayer beads are imbued with the spirit of wolf, acknowledging how their very presence helps a landscape flourish and yet that these beautiful creatures are persecuted. 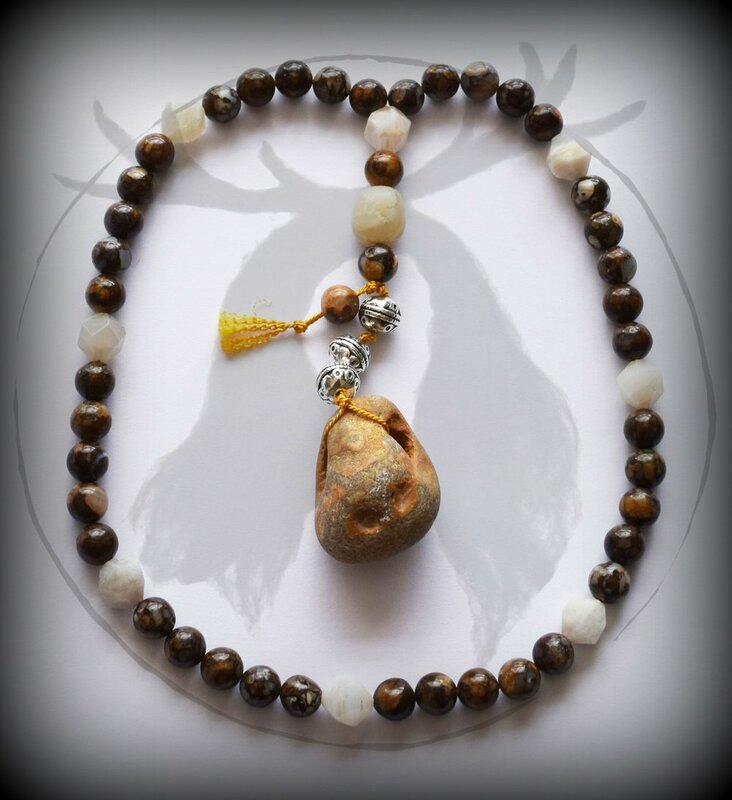 These prayer beads are inspired by the spirit of the wolf and paired with the medicine of a stone which is called the stone of spiritual warriors. The energy of bloodstone offers support and courage during times of adversity - offering the courage to take the right action to help fulfill commitments in the face of obstacles. It helps strengthen the physical body and help maintain stamina during extreme difficulty. It offers emotional support to find the courage to follow your own heart and take action on what you know in your own heart to be true. Working with bloodstone (as well as wearing or carrying it) can help foster an increased zest for living and manifest physical endurance which in today's world is something much needed by spiritual warriors. This set can be replicated - just get in touch via the form below. 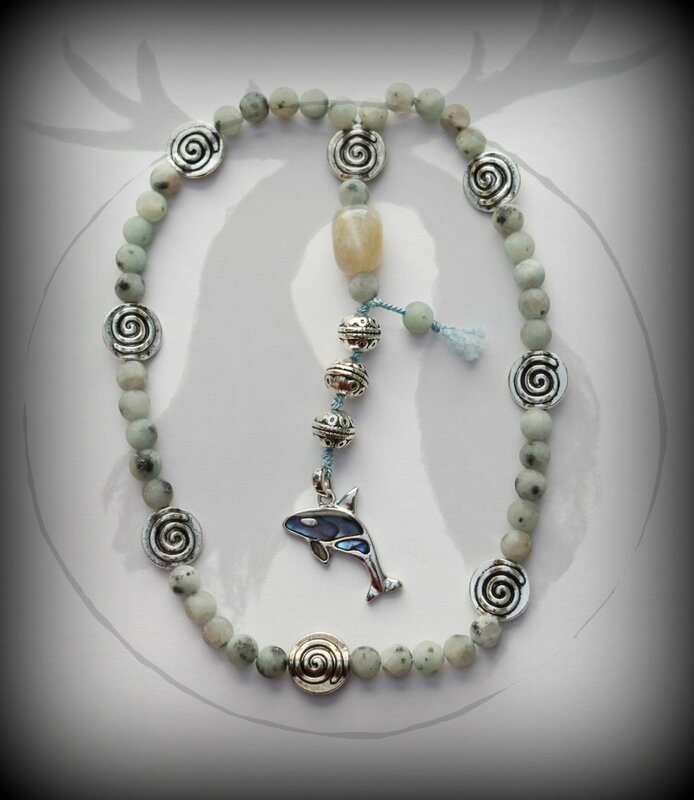 These prayer beads are inspired by the story of Tahlequah, an Orca from pod J50 from the Puget Sound in her grief ritual of carrying her dead calf for 17 days. She carried her calf for one day for each of the 17 months that it grew within her. She didn't go through this ritual alone but was supported by her pod - some taking turns to carry the calf and others most likely helped bring her food. On the morning she was spotted having released her calf her behavior completely changed for her great ritual helped in the deep grief that her and her pod felt in the loss of yet another calf. She taught us the importance of ritual in expressing our grief and helping us move through it and on back into the world where we can gather the strength to engage and create an action against all that is wrong with our world. In the case of the orca's, we can support local and indigenous people who are campaigning to allow the salmon to run as well as serious PCB poisoning this pod are starving due to a lack of their main food - the Chinook salmon. The Scottish orca pod is down to 8 individuals and Lulu an older female who died last year through getting entangled in a fishing line washed up on the Hebridean isle of Tiree was after analysis turned out to be one of the most toxic individuals ever known! This set can be replicated with any of the stones mentioned above, or stones o your own choosing. Just get in touch via the form below. Owl is a powerful teacher, living in the thresholds, the edges of both worlds. Owl helps us see in the dark, cutting through the distractions of our modern life to what really matters - just as she picks carcasses clean, stripping off flesh to reveal the bones, stripping off layers to set us free. As you pick up these beads, letting your fingers move around the circle, know that you are under her wing. This set can be created with stones of your own choosing. Just get in touch via the form below. Get in touch below if you'd like your own set of prayer beads designed just for you!